The antenatal magnetic resonance imaging (MRI) of a third-trimester primipara patient showed a fetus in a vertical position with two separate heads, a common thorax, abdomen, and pelvis with a single pair of upper and lower limbs [Figure 1]. Both heads appeared equal and symmetric with normal brain development [Figure 2]. Two separate upper cervical spinal cords fused to form a single spinal cord in the mid/lower cervical spine level. There was a single heart present in the thoracic cavity. The intra-abdominal organs appeared normal in position, structure, and number [Figure 1]. The findings were confirmed at delivery [Figure 3]. What is this variety of conjoint twins called? Is there any associated cardiac anomaly present in this case? What is the investigation of choice for evaluation of cardiac anomalies? Figure 1: Coronal T2-weighted turbo spin echo (TSE) showed the fetus in a vertical position with two separate heads, two cervical spinal cords fusing at the mid-cervical spine level, a common thorax, abdomen, and pelvis, and a single pair of upper and lower limbs and a single umbilical cord. 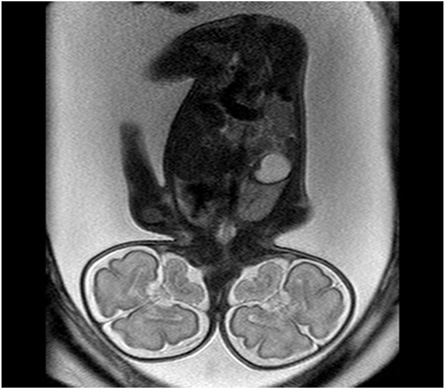 Figure 2: Coronal T2-weighted turbo spin echo (TSE) the posterior half of the fetal heads showed normally and bilaterally symmetric development of the fetal brains on both sides. Normal appearing cerebral and cerebellar hemispheres, with normal sulci and gyri, were noted. The present case was diagnosed at an advanced gestational age due to the late primary presentation, but similar cases can be diagnosed as early as the tenth week of gestation.5 Ultrasound and fetal MRI form the mainstay of diagnosis in such cases. Ultrasound is more useful at the beginning of pregnancy and for initial detection, with the ability to detect conjoint twinning around 12 weeks. However, it has limited use in defining the extent, exact site and anatomical details of fusion, which determine the prognosis and further management. Prenatal diagnosis using ultrasound and antenatal MRI plays a vital role in classification, prognostication, and management of complex conjoint twinning. An integrated approach including a radiologist, obstetrician, pediatric surgeon, and neonatologist should be practiced in deciding the viability, mode of delivery, and postnatal care required. The authors reported no conflicts of interest. The parents of the infant gave their consent for the publication of the image in this case report. I am deeply thankful to Dr. Bhupendra Bhandari for postnatal images, and to Dr. Jalpa Daftary for her guidance. McHugh K, Kiely EM, Spitz L. Imaging of conjoined twins. Pediatr Radiol 2006 Sep;36(9):899-910, quiz 1002-1003. Kaufman MH. The embryology of conjoined twins. Childs Nerv Syst 2004 Aug;20(8-9):508-525. Bondeson J. Dicephalus conjoined twins: a historical review with emphasis on viability. J Pediatr Surg 2001 Sep;36(9):1435-1444. Spencer R. Theoretical and analytical embryology of conjoined twins: part I: embryogenesis. Clin Anat 2000;13(1):36-53. Vural F, Vural B. First trimester diagnosis of dicephalic parapagus conjoined twins via transvaginal ultrasonography. J Clin Ultrasound 2005 Sep;33(7):364-366. Quinn TM, Hubbard AM, Adzick NS. 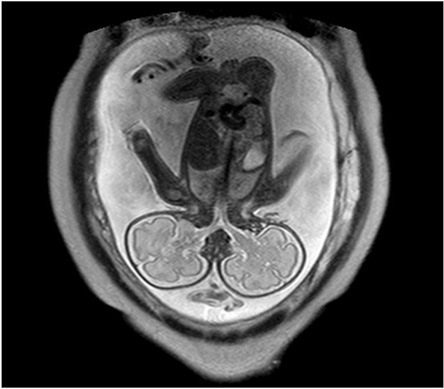 Prenatal magnetic resonance imaging enhances fetal diagnosis. J Pediatr Surg 1998 Apr;33(4):553-558. Mackenzie TC, Crombleholme TM, Johnson MP, Schnaufer L, Flake AW, Hedrick HL, et al. The natural history of prenatally diagnosed conjoined twins. J Pediatr Surg 2002 Mar;37(3):303-309. Vaughn TC, Powell LC. The obstetrical management of conjoined twins. Obstet Gynecol 1979 Mar;53(3)(Suppl):67S-72S. Başaran S, Güzel R, Keskin E, Sarpel T. Parapagus (dicephalus, tetrabrachius, dipus) conjoined twins and their rehabilitation. Turk J Pediatr 2013 Jan-Feb;55(1):99-103. McMahon CJ, Spencer R. Congenital heart defects in conjoined twins: outcome after surgical separation of thoracopagus. Pediatr Cardiol 2006 Jan-Feb;27(1):1-12. Spencer R. Theoretical and analytical embryology of conjoined twins: part II: adjustments to union. Clin Anat 2000;13(2):97-120. Owolobi AT, Oseni SB, Sowande OA, Adejuyigbe O, Komolafe EO, Adetiloye VA, et al. Dicephalus dibrachius dipus conjoined twins in a triplet pregnancy. Trop J Obstet Gynaecol 2005;22:87-88.